So, at this point, Dance Academy is kind of "just there" for me. It's not interesting enough to keep covering, it doesn't make me laugh, you kind of see where some things are going, and they really can't focus on more than one character (besides Tara) per episode. Just in case it turns around, we'll continue posting about it, but we're moving to a bullet-point format... it's a waste to give it the same treatment as other series. We still reserve the right to cut the show should the quality decline further. Here's something interesting, though... the kids apparently take non-dance courses. This makes sense, given that they haven't graduated or anything, but it's mostly skirted on the program. To get out of Christian's room, Kat, Sammy, and Tara say they have to do anatomy homework. But, in the eleven episodes we've seen now, we've never seen them do any academic work - just dancing. You'd think that someone would have academic troubles or be working on a paper at some point... but not yet. The closest we came was Sammy showing his parents a report card, but the subjects aren't mentioned. 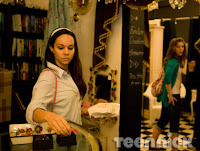 - Abigail and Tara go to an antiques shoppe to look for another mirror, but Abigail is caught shoplifting and the storekeeper thinks Tara was acting as a distraction. Abigail admits to Tara that she likes getting away with things - it gives her a rush of power. The girls are banned from the store, but no criminal charges are pressed.